regarding the mother's curse though, gosh my boys were so sweet when they were little and growing up.... if all I remember is the good stuff does that mean I'm getting Alzheimer's already? yes, severe arthritis due to lyme's and a career that requires walking in rough conditions, means that I have to walk less on the weekends- 3 joint surgeries so far and I'm sure there will be more. I can't carry any significant weight (not even 10 lbs) on my shoulders for more than an hour (shoulder reconstruction helped but there are limits) so "ultra light" is not an option. I started with burro packing when my need for medical supplies, warm clothes, and padding exceeded my carrying capacity. now that I am limited to less than 5 miles of walking in a day, I am switching to riding to get into the wilderness. I would prefer to walk- cheaper, simpler, less limited in routes, but my hips and knees say no mas. 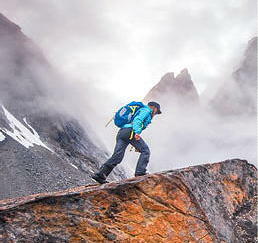 Good for you for adapting to keep going outdoors instead of throwing in the towel. Nothing wrong with transitioning to pack animals. Whatever it takes! yup, that's about it. We only have so long, so don't waste time worrying about what you can't do, just go for what you can do.